This is not my area of research at all, but I think it’s super cool. 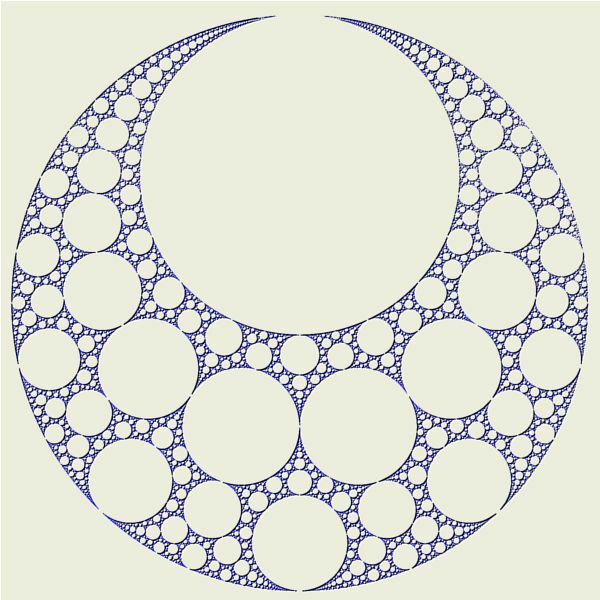 The first time I heard of Apollonian circle packings was at that conference I went to in Marseille last month, during the first lecture of Hee Oh’s minicourse. So here’s a quick write up background of the first third of that lecture. These packings and all this theory come from one dude, Apollonius of Perga, who wrote a bunch of math books back around 200 BC. Literally this math has been around for 2200 years. Here’s a paper submitted a month ago which is a generalization of Apollonius’s problem from circles to spheres. Math is so amazing! We live in history! To understand the problem, we’ll have to do a quick geometry brush up. 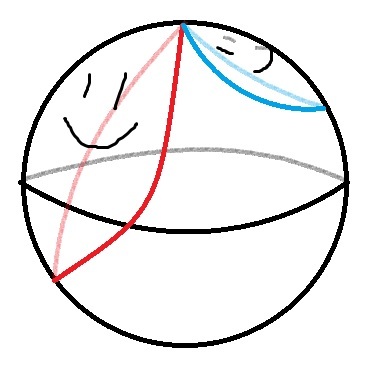 We say that two shapes or curves or lines in the plane are tangent if they touch at exactly one point. We’re so sad! 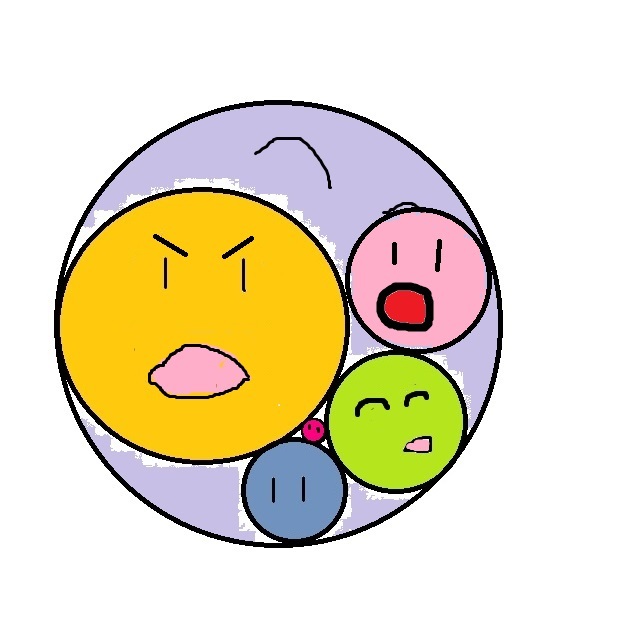 We want more mutually tangent circles! A few other ideas that immediately come to mind if you see this theorem: what if the circles aren’t mutually tangent, but just lying around the plane? (per Wikipedia this is the actual Problem of Apollonius) What if you use spheres in the three dimensions instead? 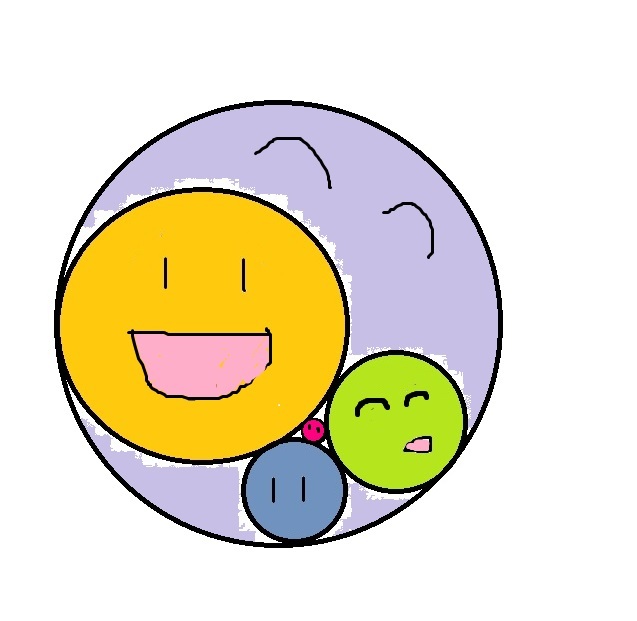 What if instead of circles you use other shapes? 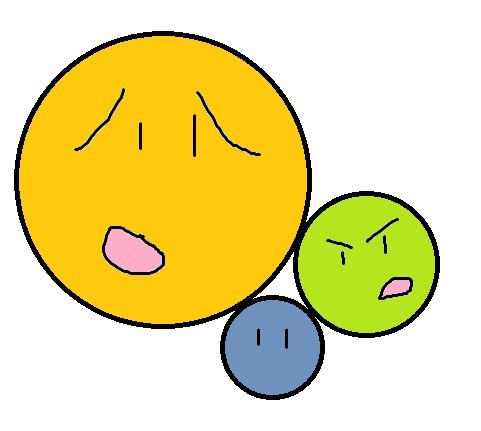 Can we tell, given the radii of our first three circles, how big the other two will be? These are all big problems in math that many people have thought about (but I have not). Here’s a cool thing that can happen: if you take three mutually tangent circles, per the above theorem we can draw two more that are mutually tangent to them. Now if you take one of these new circles, and two of the other ones, per the theorem again we can draw two more mutually tangent to those three. See picture below. Then you can do this over and over again: for instance, we’ve still got lots of circles to build which are mutually tangent to three of the circles in this picture (how many did you count? I count eight on first glance. Remember that the dark blue and light pink circles, for instance, aren’t tangent, so you wouldn’t count a triplet with those two in them). And then once you build those new circles, you get more circles. Do this forever and you have an Apollonian gasket, a type of fractal. I’m not going to build an Apollonian gasket to show you, but the internet has lots of pictures. I just wanted to put in the pretty pictures. Let’s prove Apollonius’ theorem! Review: the complex plane looks like the real plane, with coordinates (x,y), but the y-axis represents multiples of the imaginary number i, where . So if you see a coordinate like (2,3) in the complex plane, it represents the complex number 2+3i. If you aren’t that familiar with i, you can think of it like a variable. So in algebra, if you wanted to simplify the expression 3(x+4), you would have 3x+12, not 15x nor 15, because the x lives on its own. Similarly, we add complex numbers like this: (2+3i) + (5-7i) = (2+5) + (3-7)i = 7-4i. If we add a point at to the complex plane, we’ll get the extended complex plane, . One way to think of the extended complex plane is as a big ball, with the point at infinity at the north pole, and the origin (0,0) at the south pole, the unit circle (the circle with radius 1) lying on the equator, and the rest of the complex plane wrapping around to get closer and closer to infinity. This way of thinking about the extended complex plane is called the Riemann sphere. You can drop it back down to the complex plane by drawing a line from a point on the sphere to the point at infinity, and figuring out where the line hits the sphere. In more concrete terms, imagine putting a tennis ball on a piece of paper. Use a marker to draw a point on the tennis ball, then use a super high power laser and shine a line from the north pole of the tennis ball to hit that point. You’ll burn a hole in the paper, which is exactly where the corresponding point on the complex plane lies. 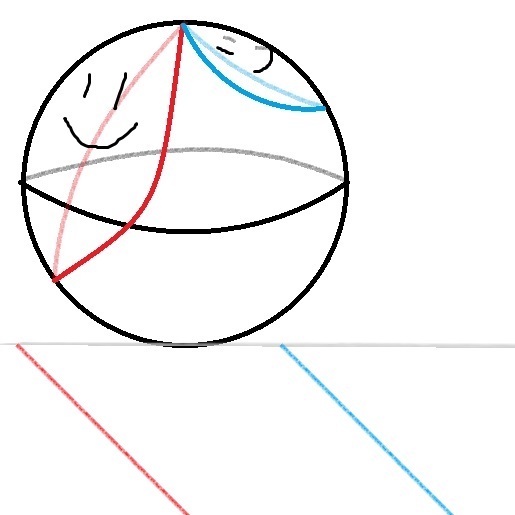 The blue and red circles both wrap around the sphere. If we project these circles down onto the plane as we were saying before, you get parallel lines: the point at infinity heads toward “infinity” in all directions. So now we have a few new configurations for tangent circles. Here’s a fact: if you multiply all the points in two tangent circles in the extended complex plane by a matrix so that , the resulting circles will still be tangent to each other. A condition you need is that ad-bc=1 for this to be true, which can be a bit tricky since a,b,c, and d are all complex numbers. More facts: if you’ve got any two circles, you can always find a matrix that will send one circle to another one. You can actually do this for any three circles to any other three. Okay, now we’re going to prove the theorem. Take your three tangent circles, and choose a matrix A to map them to two parallel lines with a circle in between them. Where do we put mutually tangent circles? This makes it pretty clear that there are only two choices for mutually tangent circles. Adding the blue and green circles! 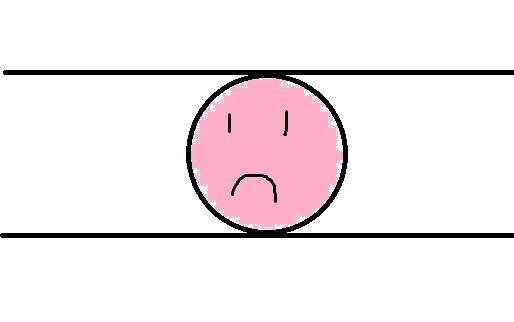 Now multiply everything by to send the pink circle and parallel lines back to your original three circles. 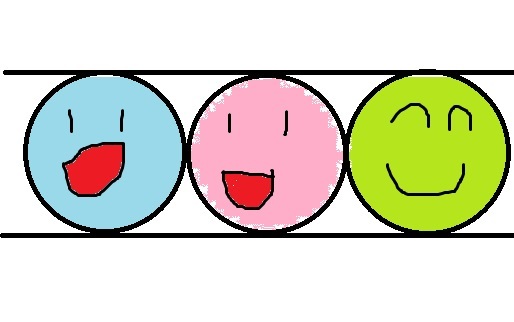 From our first fact, when we multiply the blue and green circles by , they’ll still be parallel to the pink circle and parallel lines. So that’s all the ways you can find circles mutually tangent to three given, mutually tangent circles. That’s your introduction to Apollonian circle packings! I will probably never blog about them again, unless I randomly see another talk on them. This was the first quarter or so of the first lecture by Hee Oh. Other references: wikipedia. P.S. Sorry that I’ve been doing such a bad job over the past few weeks of blogging every week (I think I’m averaging every 9 days). I moved in with my SO three weeks ago (yay!) and am still trying to figure out how to live with someone with whom I want to hang out all the time. Also we don’t own lots of baking ware (I just bought a glass pyrex casserole dish, which we didn’t have before. We don’t have a cookie sheet. We had to buy some measuring spoons.) So I haven’t been baking as much. And I can’t seem to find my camera battery charger! It’s a little hectic. Happy winter!